Matthew Baugh: Ex Calce Liberatus starring Arsène Lupin, Kogoro Akechi. Bill Cunningham: Trauma starring Fantômas, The Gren Hornet, Maigret. Win Eckert: The Eye of Oran starring Doc Ardan, Fu Manchu. G.L. Gick: The Werewolf of Rutherford Grange starring Harry Dickson, Sâr Dubnotal. Rick Lai: Dr. Cerral's Patient starring Victor Chupin. Serge Lehman & Fernando Calvi: The Mystery of the Yellow Renault starring Rouletabille - The Melons of Trafalmadore starring Doctor Omega. Jean-Marc Lofficier & Fernando Calvi: Arsène Lupin's Christmas starring Arsène Lupin - Figaro's Children starring The Phantom of the Opera - The Tarot of Fantômas starring Fantômas - The Star Prince starring Doc Ardan, The Little Prince - Marguerite starring The Nyctalope - Lost and Found starring Judex. Xavier Mauméjean: Be Seeing You! starring Arsène Lupin, The Prisoner, Sherlock Holmes. Sylvie Miller & Philippe Ward: The Vanishing Diamonds starring the Invisible Man, the Time Traveller, the Three Musketeers. Jess Nevins: A Jest, To Pass The Time starring Arsène Lupin, Belphégor, Fantômas, Zenith the Albino. Kim Newman: Angels of Music starring Irene Adler, Josephine Balsamo, The Phantom of the Opera, Trilby. John Peel: The Incomplete Assassin starring Michel Strogoff, Rouletabille. Chris Roberson: Annus Mirabilis starring Albert Einstein, Dr. Omega. Jean-Louis Trudel: Legacies starring Arsène Lupin, Lady Diana Wyndham. Brian Stableford: The Grey Men (first part of The Empire Of The Necromancers) starring John Devil, Gregory Temple. On the rooftops of the Louvre, Fantômas duels with Zenith the Albino. Meanwhile, in Surrey, the Sâr Dubnotal and Harry Dickson team up to destroy the Werewolf of Rutherford Grange. Arsène Lupin joins forces with Kogoro Akechi to thwart the Vampires, and with Lady Diana Wyndham to outwit Baron Karl von Hessel. The Countess Cagliostro runs afoul of the Phantom of the Opera's Angels of Music and Rouletabille meets its deadliest challenge. D'Artagnan faces an untimely impediment on his quest to recover the Queen's diamonds. Doctor Omega meets Albert Einstein and ponders the mystery of the Melons of Trafalmadore. And also Judex, the Nyctalope, Doc Ardan, Fu-Manchu, Sherlock Holmes, John Devil, Frankenstein and many more! This second anthology of all-new stories, featuring Heroes and Villains from Pulp Literature, edited by JM & Randy Lofficier, combines the talents of renowned authors such as Kim Newman (Anno Dracula), John Peel (Doctor Who, Star Trek), Brian Stableford (Inherit the Earth , Architects of Emortality), Chris Roberson, Serge Lehman, Xavier Mauméjean, Jean-Louis Trudel, with a new generation of gifted storytellers such as Matthew Baugh, Win Eckert, G.L. Gick, and Bill Cunningham. 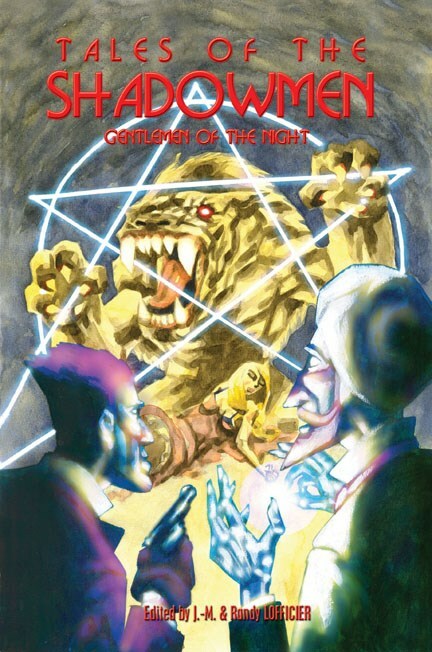 From the same publisher comes Tales of the Shadowmen: Gentlemen of the Night edited by Jean-Marc and Randy Lofficier, an anthology of new stories about old favourites from French, British and American popular fiction. The authors reflect this wonderful mixed heritage, including as they do Philippe Ward, Sylvie Miller, Kim Newman, Brian M Stableford, Rick Lai and Win Scott Eckert (thatâ.s not all of them, and in any case I shouldn't omit Jean-Louis Trudel from Canada). Itâ.s many decades since Maurice Leblanc decided to pit Arsène Lupin against Sherlock Holmes, and the years since then have seen many such matches. Batman has encountered Sherlock Holmes and Judge Dredd. At least four writers have had Holmes meet Count Dracula â. one has even posited a blood relationship [sic]. And Philip Jose Farmer devised a complex and almost convincing connection between just about all the popular heroes you can think of, including of course Sherlock Holmes. Several of the authors represented in Gentlemen of the Night have consciously drawn on Farmer's Wold Newton Universe. The range of sources represented in these stories is extraordinary. Besides Leblanc and Conan Doyle, you'll find the creations of Georges Simenon, Sax Rohmer, Gaston Leroux, Dashiell Hammett, Alexandre Dumas, Grant Allen, Jules Verne â. and so the list goes on. The temporal settings generally range from the 1870s to the 1920s, though as at least one adventure involves H G Wellsâ.s Time Traveller, you'll appreciate that there are exceptions. Holmes is in there, of course, in a neat little tale called Be Seeing You! by Xavier Mauméjean, which suggests an even more intriguing background to Patrick McGoohan's extraordinary 1960s television series The Prisoner. As always from Black Coat Press, the book is attractive and enticing, and these Tales of the Shadowmen are deliriously exciting.